Full of antioxidants this salad is a great dish on it’s own or served with fish or chicken as a side dish. Boil the quinoa as per the packet instructions then drain and set aside to cool. Meanwhile boil the kettle. Chop off the very ends of the broccoli (I only use the small florets in this salad) then place in a bowl with a pinch of salt. Pour boiling water over the broccoli to blanch it for a couple of minutes then drain it with a sieve and set aside to cool. 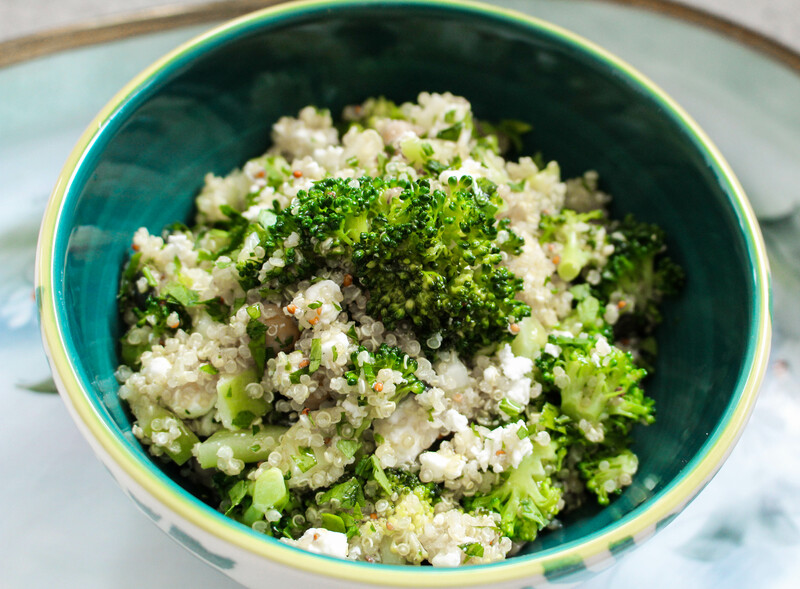 Chop the celery and apple into small pieces then place in a large mixing bowl with the cooled quinoa, chickpeas, pumpkin seeds, parsley and Feta. Season with salt and pepper then add a generous dash of white Balsamic vinegar and a glug of olive oil. Mix well to dress the salad, checking the seasoning then finish with a squeeze of lemon juice to serve.